If someone were to ask you who you thought the all-time top five college basketball programs in the country are, Coach Mike Krzyzewski and the Duke Blue Devils are probably on that list. Duke is consistently ranked in the top 10 year after year, and often the top 5. Come March, you typically find them in a race for a national championship. However, March Madness has gotten the best of the Blue Devils in recent years. Although they have earned two national titles in the last 10 seasons, early tournament upsets have plagued them, even when they were loaded with talent. In 2012 and 2014, they lost in the round of 64, and in 2008 and 2017, the round of 32 sent them home. 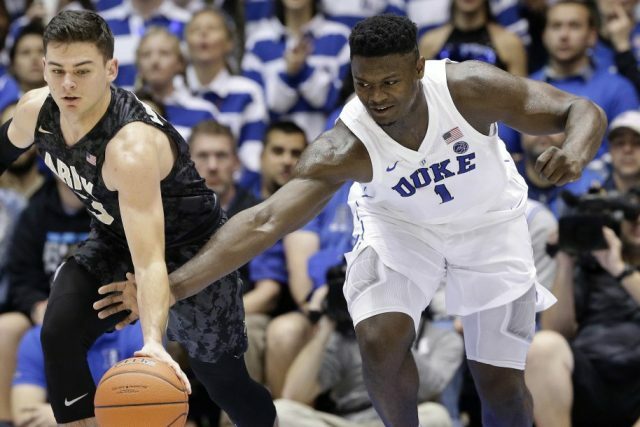 Although Coach K’s Blue Devils have been relatively prone to early postseason upsets, this season could be a whole different story. Krzyzewski struck gold with this year’s recruiting class, landing the top three recruits in the country according to ESPN’s 300: R.J. Barrett, Zion Williamson, and Cam Reddish. This trio already had significant hype surrounding them before the season started — and then they began to play. The Blue Devils opened the season ranked fourth in the country and would be challenged in their first game against second-ranked Kentucky, or so everyone thought. Duke, specifically Barrett, Williamson, and Reddish, dominated all facets of the game, and the contest was over before halftime. The Blue Devils would rack up 118 points against the Wildcats in a lopsided 34-point win. Duke is now 4-0, and have moved into the spot of top ranked team in the country winning their games by an average of 30 points. In their first three games, the three power freshman have scored the same amount of points as all of Duke’s opponents combined (202), and are averaging 67 out of the team’s average 98 points per game. There have been Duke teams in the past that have been built with NBA-type talent, but this team is different. They are stacked and they are young. The chemistry these freshmen have exhibited makes Duke look untouchable, similar to Nick Saban’s Alabama Crimson Tide football program who are favorites to win the national title almost every year. If the Blue Devils can defeat the second-ranked team in the country by 34, they can easily mow their way through the season and even the NCAA Tournament. It may be early, but it wouldn’t be a surprise to find a good portion of NCAA March Madness brackets crowning Duke as National Champions. Ryan Campbell is a senior mass communications student at York College of Pennsylvania, where he is also the general manager at WVYC-FM Radio, and an on-air Sports Broadcaster on WVYC and the Spartan Sport Network. Ryan hopes to pursue a career in sports broadcasting and sports media after graduation.